LOCOMOTIVE Services BR 7P 4-6-2 No. 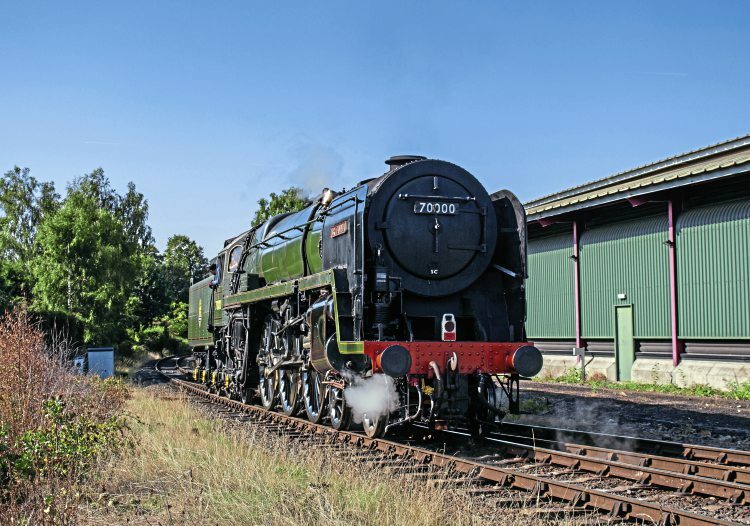 70000 Britannia is set to return to the main line following its appearance at the Severn Valley Railway’s September 20-23 autumn steam gala. It will use its visit to the gala (News, page 40) to check that the vibration problem which has kept the engine off the main line for two years has been resolved, and it can take its place in the railway’s end of September gala. In early October, it will return to Crewe under its own steam, using the movement as a test run, after which, it will hopefully be ready for main line work. No. 46100 Royal Scot – in action on Saturday, September 8, working Saphos Trains’ ‘William Shakespeare’ from Crewe to Stratford-upon-Avon, – is also appearing in the gala, the engine going under its own steam to Kidderminster. On returning to Crewe, the 4-6-0 is to be stopped for new tyres. ‘Black Five’ 4-6-0 No. 45231 The Sherwood Forester remains at Southall, where its annual overhaul continues to drag on. It is understood there are still plenty of ‘nags’ to be dealt with, the engine remaining stopped for repairs. It will miss its booked trip with Pathfinder’s Birmingham to Carmarthen ‘Sugar Loaf Mountaineer’ on Sunday, September 23. At the time of writing, no replacement engine had been posted for this train, which had already been postponed once. Read more News and Features in Issue 246 of HR – on sale now!